B3P19A HP 727 Designjet Ink Cartridges are designed together with your HP Designjet printer as an optimized printing system. Original HP inks can help reduce downtime and improve productivity. Crisp, fast-drying, smudge-resistant prints help you keep pace. Save time with trouble-free printing. 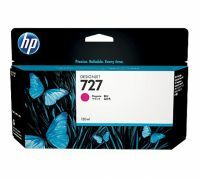 To get the consistent quality you need, look to Original HP inks designed with your printer as an optimised printing system. Fast-drying, smudge-resistant prints help you keep the pace. It's your choice. Enable more unattended printing with high-capacity 300-ml ink cartridges. Or save using more affordable 130-ml ink cartridges.2 Ink cartridge return and recycling is free and convenient. 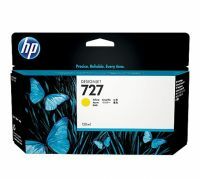 To Recieve updates and possible rewards for Hewlett Packard (HP) HP 727 130-ml Cyan Designjet Ink Cartridge please sign in. To Recieve updates and possible rewards for Printer Cartridge, Ink & Toner please sign in.